Case type rules enable you to nest cover work types within other covers in parent-child relationships. This capability helps centralize flow processing and monitoring among multiple work types in large applications. You can nest any number of parent and child covers. To employ a case type rule, you add it to a cover class. In the rule you define the work classes you want covered. During a work session, users can create work (starting flows) in the cover case using the Add Work drop-down field in standard cover Perform, Review, and Confirm harnesses and Action sections. 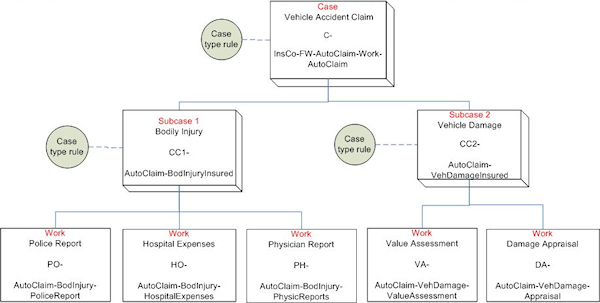 This article uses a simple case management application that shows you how to configure case type rules that enable users to create a top level cover object (case), add cover objects covered by the case (subcases), and add work types covered by the subcases. An Auto Insurance application has a top-level case called Vehicle Accident Claim. A claim creates a cover object (C-n) . The case is supported by two subcase cover objects (CC1-n) and (CC2-n), each of which is handled by users in separate departments. The subcases contain work types that are not usually but may be shared when necessary. Using case type rules, users can more easily consolidate, view, and manage the work in at every level throughout the case. The diagram below shows the class structure — text in each box shows the work object description, prefix, and work type. It also shows the cover classes that contain case type rules, which you use for enabling cover-within-cover work types. 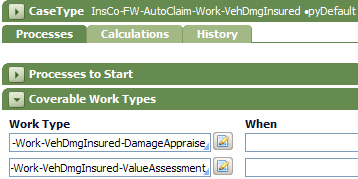 Create a case type rule ( Rule-Obj-CaseType ) in class InsCo-FW-AutoClaim-Work-AutoClaim . On the Processes tab, add two rows in the Coverable Work Types section. Select Work-VehDmgInsured and Work-BodInjurInsured . Below is the Work-BodInjurInsured case type rule, which includes its own covered work types. However, users working in a Bodily Injury subcase must add a Damage Appraisal work object when hospital expenses exceed $40,000. To enable this capability, you add the Work-VehDamageInsured-DamageAppraise work type and associate it with a when rule called HospitalExpOver40K. Each time a user brings up a cover object, the system calls an activity that evaluates the when rules on the case type rule and populates the Add Work dropdown. In this example, if the hospital expense value is greater than $40,000, the when rule evaluates to true and the user can add the work. 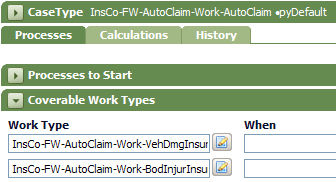 The user clicks New in the user portal and selects Start Auto Claim to create a case object (C-1 in this example). He then selects the Add Work pull-down list in the Action bar. The list includes starting flows in the classes you added to the case type rule. He selects Start Bodily Injury. He clicks Create in the New work object form to create Bodily Injury work object CC1-1. 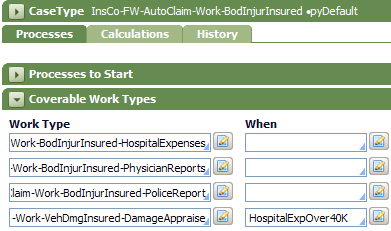 To create a Hospital Expenses object covered by CC1-1, he selects Obtain Hospital Bills from the Add Work list in the Action bar. This creates Hospital Expenses work object HO-1. To create a Physician Reports object also covered by CC1-1, the user selects Obtain Physician Reports from the Add Work list in the CC1-1 header. This creates Physician Reports object PH-1. In the PH-1 form, the user selects the All tab to display a list of open work covered by CC1-1. As the claim progresses, the user working in Obtain Hospital Bills has determined that the hospital bills exceeded $40,000. The user then opens the the CC-1 object and selects the Add Work list in the Action bar. The Appraise Damage work type is now available (due to the when rule). He creates the DA-1 Damage Appraisal work object. To access other subcases also covered by C-1, the user selects the (CC1-1) link on the header tab. This opens the CC1-1 cover object. The user selects the All tab to display the list of cover objects under C-1.